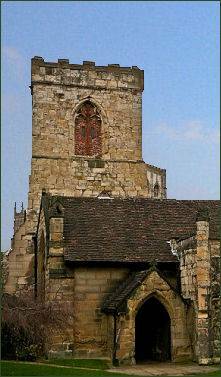 Holy Trinity Church, Goodgramgate, York. Holy Trinity Church, a characterful Grade I listed building and one of York's hidden treasures, is situated through a brick archway leading off from busy Goodramgate shopping street. The archway dates to the eighteenth century while the buildings adjoining it once served as artisan's workshops and date back to the medieval period. Described by the poet laureate John Betjeman in his Guide to English Churches as ' a delightful medley of different materials, colours and textures, many due to parsimonious repairs in the past', the characterful building dates from between 1250 and the late fifteenth century but retains some features from its twelfth century foundation. Little has changed in the church since the eighteenth century and entering the building is like walking back into the Georgian era. The buildings in the quiet, leafy churchyard, known as Our Lady's Row, date back to the fourteenth century and divide the churchyard from Goodramgate. The timber-framed cottages date from 1316 and are one of the earliest examples in England of the medieval jettied houses, where the upper story extends outwards above the lower. The houses are very simple, made of plastered timber framing with roofs of curved pantiles. The original row was 128 feet long and only 18 feet deep, and had two storeys and eleven bays. The houses were built for the poor of York and mostly just one ground floor room, and one first floor room.A former Chantry Priest's house, which also once stood in the churchyard, was demolished in 1827. The colourful medieval stained glass east window is of late Perpendicular style and dates back to 1470. It was given to the church by its then rector the Reverend John Walker. The window depicts St George and St Christopher, with other saints, along with heraldic shields. The central panel portrays God as the Trinity holding the dead Christ, while the Reverend Walker is depicted reverently kneeling at the base. Holy Trinity Church boasts a rare double-sloping, or 'saddleback', roof and an unusual medieval pool - a 'piscina' - which was once used to wash the chalice after the service of communion. The plain font dates from the fifteenth century while the pulpit dates from 1695. The box pews which date to the seventeenth century, are unique in York. The high sides of the pews provided worshippers with both protection from draughts and some privacy as the service took place. The church contains an inner chapel; this was once isolated from the main body of the church and allowed lepers to take part in services via a squint hole in the wall. Part of the Chancel dates back to the twelfth century; the Tower and North Aisle were added in the early fifteenth century. Two boards record the names of past Lord Mayors of York, including George Hudson, known as 'The Railway King', who turned York into a major railway centre in the nineteenth century. The building neither gas, electricity or running water and is still illuminated by candlelight. 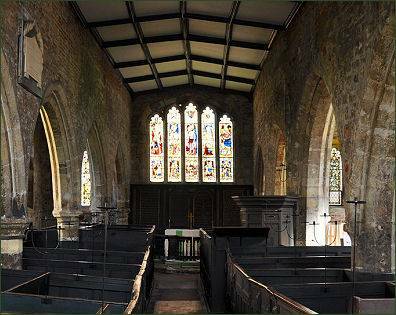 The Church was declared redundant in1971 and is now in the care of The Churches Conservation Trust and is open to visitors.